We just had a lovely week hosting an exchange student from Paris. She was part of a group of 30 plus students from a high school there. They had a busy week, visiting New York and Ellis Island, meeting Westfield's mayor and attending Westfield High School. Au Revoir Leia! Well, you knew it had to happen someday. Matt got his drivers license on Tuesday and tonight he asked for the car keys. My history gene made me ask Allen to photograph the moment...beware Westfield! Celebrated Valetine's Day by having dinner at a restaurant in Newark--27Mix. Located at 27 Halsey Street, it has the urban feel without having to traverse a bridge or tunnel. Halsey Street has a mix of abandoned buildings and some going concerns. The area is being helped by NJPAC and the new Prudential Center. 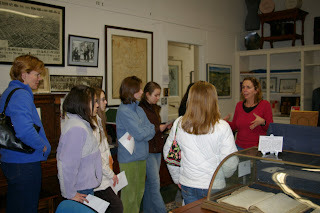 Girl Scouts from Roosevelt toured the Westfield Historical Society Museum & Archives today. They are working on their Silver Award and the project is the Women of Westfield! They have completed lots of research and conducted some oral histories--should be a great addition to the collection! 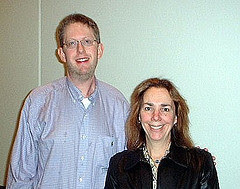 Eric & I just returned from the 2008 SLA Leadership Summit held in Louisville, KY. The meeting provides a great opportunity for Chapter and Division leaders from the entire organization to get together and share ideas. We were hosted in a most hospitable manner and had networking time at the Louisville Slugger Museum and other meals to get to know each other. SLA CEO Janice Lachance reported that the Association is operated in the black in 2007 and gained 127 new members. Individual subjects covered at the meeting to follow.